When it’s time to clean the bathroom floor it may seem like it’s an impossible task, intimidating, and discouraging. Using the right cleaning agents make all the difference in scrubbing down, cleaning, and preventing future dirt and grime buildup. Without the right cleaning ingredients, this can become an easier albeit not the most enjoyable task. It’s critical that you prepare and use the right types of chemicals when cleaning your bathroom tile or you could cause damage or make it worse. Let’s consider some steps to prepare, treat, and prevent future dirt build-up on your bathroom tile floor. One of the most effective, natural ingredients is not bleach or other powerful and harmful ingredients that can be tough to breathe in or leave a funky smell behind. In fact, one of the most optimal cleaning products is simply vinegar with water. Vinegar acts as a natural cleaning agent to remove dirt, mold, hair, and other sticky residues accumulated on your bathroom floor over time. Prepare yourself two buckets, fill both with warm water, and mix one gallon of water with a cup of vinegar in the other. A mop is very useful, but it’s helpful to also get some sponges just in case you come into hard to reach places. Rags can be helpful as well, and if you have an old towel or shirts you don’t use anymore you can use these to dry the floor when you’re done. Try to find yourself a pair of gloves and open up the windows if possible to keep away the tough, potent smell of vinegar. If you do not have windows to open in the bathroom then setup and turn on a fat to circulate the room while you clean but keep it at a distance so that it does not make a mess and blow all of the dirt all over and make the job tougher. If it’s been a while since you’ve cleaned your bathroom tile floors it may be necessary to add a few drops of dish detergent to the water solution you make to add dirt removing strength. 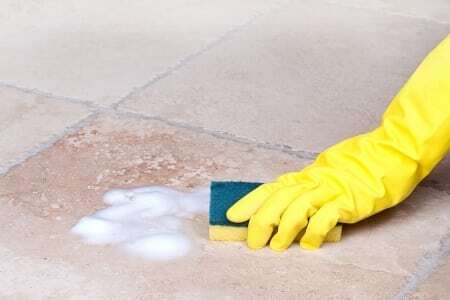 If you have marble or stone floors then this method and these ingredients are not recommended as they can be harmful. If you have especially troubling dirt and debris build-up on your bathroom floor it may also be necessary to use an anti-bacterial soap to really get everything clean. Remember, it’s not so much of how good it smells in your bathroom when you’re done, rather, it matters most that you’ve got all the dirt up and have properly dried your floors – as moisture can attract and build up bacteria and dirt again. Happy Cleaning!